Last weekend when I cleaned out the refrigerator, I found out how very many vegetables I had that needed attention. I decided that the best course of action was to roast them and make a sauce out of them. I did this last summer when I became overwhelmed with eggplants, yellow squash, and zucchini. Then all winter, I smuggled vegetables into my family’s dinner without their knowing it. Oh yes, yes, I did. I’ve done this with winter squash, too. Super yummy and an easy way to get your people to eat their veg without putting up a fight. First, get out your vegetables, olive oil, salt, and pepper. Grab a large rimmed baking sheet, too. Ready, let’s go. Once you’ve trimmed the vegetables and split or sliced them, lay them out in a single layer. You can do this with peppers, onions, tomatoes, summer squash, eggplant, and probably other things, too. Drizzle them with olive oil — I used 1/2 cup for this batch — and season them generously with kosher salt and freshly ground black pepper. 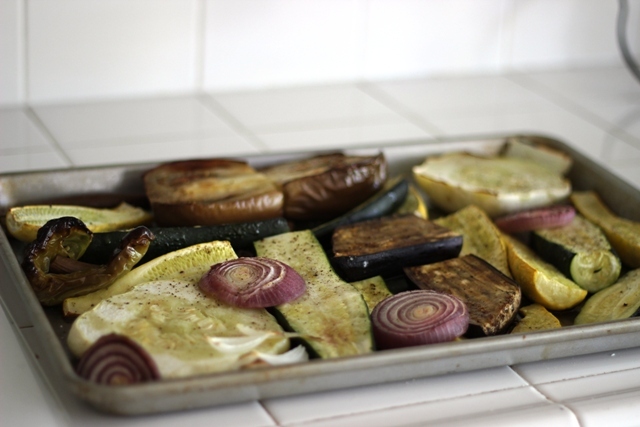 Slide the pan into a 400 ° oven and roast the vegetables for 30 to 45 minutes. Watch to make sure they don’t char. These are great to eat as is. The roasting caramelizes the vegetables and gives them great flavor. Chop them and toss into salads, layer onto pizzas, sneak into lasagna. If you want to be more stealth, make a sauce out of them. Toss them in a pot and scrape all the juices from the baking dish into the pot as well. You can add a bit of water or a can of tomatoes, whichever you like. Throw in a bay leaf and a few cloves of garlic, too, if you want. Simmer it all for about 30 minutes. Then grab the immersion blender and smooth it all out. 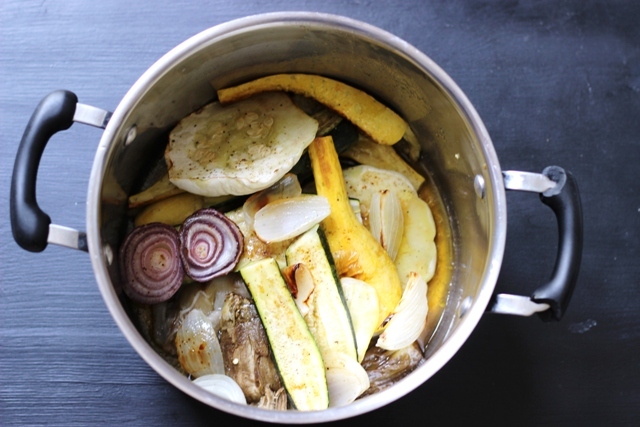 The vegetables will have softened further upon simmering and will be very soft and blend quite easily. The immersion blender is one of my favorite tools — and you know how I love small kitchen appliances! It does a great job of smoothing things out without having to dirty another dish. 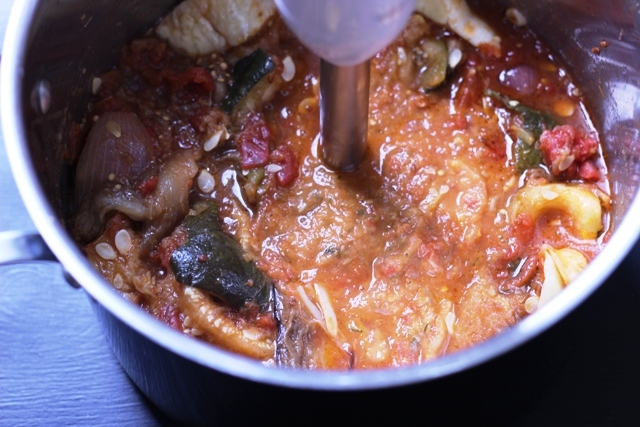 Now, you have a veggie-rich sauce to stir into soups, chiles, sauces, and casseroles. It adds flavors and nutrients that no one will notice, but will still be really good for them. 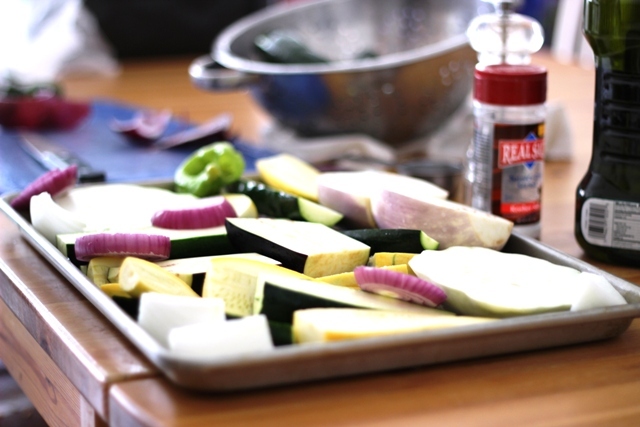 I’ll be sharing some recipes for using Roasted Vegetable Puree in the coming months. So, go make a batch and stash it in the freezer! 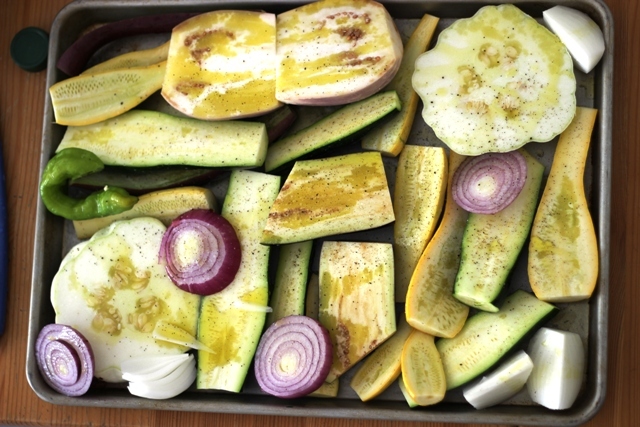 Trim and halve the vegetables and place them in a single layer on the sheet pan. Drizzle with the olive oil and season generously with salt and pepper. Roast for 30 to 45 minutes or until very tender and starting to brown. Place the vegetables in a large pot. Scoop the flesh out of the eggplant, if using, and discard the peels. Peel the pepper skin off and discard, if using peppers. Add water or tomatoes, garlic, and bay leaf. Simmer for 20 minutes until the vegetables are very tender. Can be cooled and frozen and used later. Could you use this as a sauce on pasta instead of using tomato sauce? I think so, if you spice it up some. I haven’t, but I think it should be fine. Just cool completely and wrap well. They might get softer, so keep that in mind. Just ran across this & will definitely be trying it! Could you please post links to the recipes that use the sauce? Thx! Not a veggie eater but I am trying to do better! Thanks for the roasted veggies ideas. Will be checking out you blog next. Thanks and have an excellent whatever!